Scouting was founded on the principal of service to others, and the organization remains dedicated to that purpose. The goal of the Community Service Committee is to foster that ideal, to assist Scouting units in achievement of their community service objectives, and to recognize units and Scouts who perform service to others. The Community Service Committee consists of representatives from each one of the Council’s districts, and other individuals who understand the importance of service to Scouting. The committee typically meets on the fourth Wednesday of the month, and welcomes new members. The Legend of the “Unknown Scout,” whose good turn on a foggy London street in 1909 inspired William D. Boyce to establish the Boy Scouts of America. It’s a win – win for Scouting and the community, benefiting the organizations and people where we live. It teaches youth life-long lessons about the importance of community involvement and volunteerism. It gives your unit’s program calendar, greater structure, variety and worthwhile activity. It enables your unit to achieve its “Journey to Excellence” service project goals. What types of activities are considered Community Service? According the Boy Scout Handbook, “A service project is a special Good Turn that puts Scout Spirit into action.” Some Good Turns are big—saving a life, helping out after disasters. But most Good Turns small, thoughtful acts—helping a child cross a busy street, or going to the store for an elderly neighbor. Scout Leaders are always the best source to ask regarding this question, as each Unit may have different ideas regarding the nature of community service the Unit wants to record. Should a Unit record community service hours that are not counted towards advancement? Absolutely. Scouting Principles embody a commitment to service. One of the purposes of community service is to show leadership in service work. Many Good Turns are done that are not advancement related and all should be encouraged to be recorded. (For advancement, Scoutmasters must approve the service). Why is it important to report service hours? Meaningful, visible service projects show the community the value of Scouting and permit Youth to learn leadership and demonstrate the Scouting Spirit. Recording service hours enables Scouting to validate its contributions to youth and the community. Internally, it builds pride among participating Units. Externally, it serves a valuable means to increase membership, and to promote Scouting overall. We did a project months ago, is it too late to report the hours? No. You may report the hours for projects at any time. While not preferred, you can also aggregate similar projects together as one entry. Reasonable, good faith estimates of time, people, and/or donated items are acceptable. Should the hours of non-Scouts or non-Leaders be included in the total hours? Yes. the hours of all volunteers should be included. We need the assistance of everyone in the community. Reported hours should include everyone who participates in the service project. What about “double counting,” where a Scout used hours for school and for advancement or Scout? These hours may be recorded. Advancement Guideline 4.2.3.6. contained a “significant change” and clarified “that counting service hours provided elsewhere in the community is not ‘double counting’ and they should be counted toward advancement.” If hours can be counted towards Advancement, then hours can also be counted and reported as community service hours. Logging into the JTE system can be really confusing. How can you help? We recognize that the BSA online reporting system can be difficult and confusing. Just “Do Your Best” in completing as much information as you can. There are no mistakes, other than not reporting hours! If something is not recorded properly, you can change your entry later. 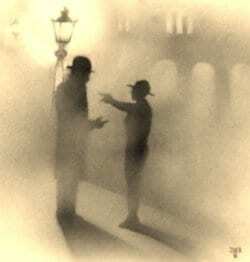 Reasonable, good faith estimates and simple descriptions are fine. 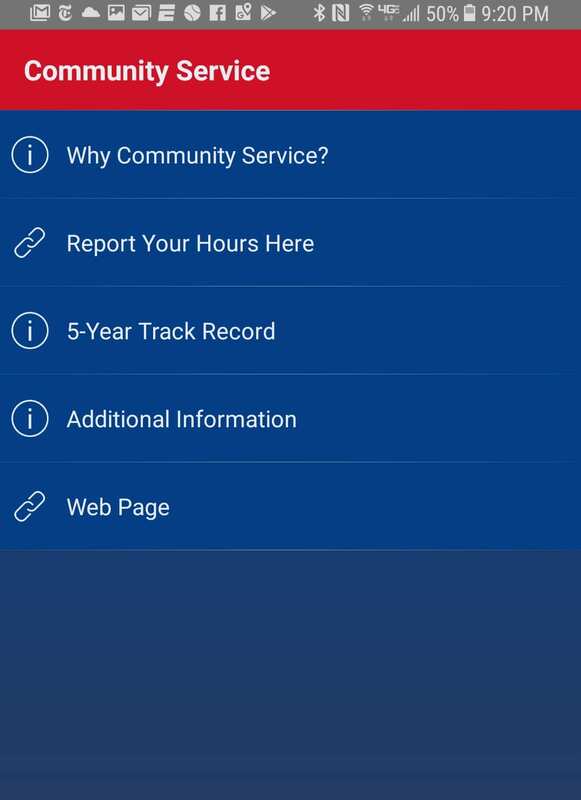 An alternative (and easier) method for recording hours is to use the “Patriots’ Path BSA” app, which can be downloaded to your handheld device from GooglePlay. When should I use the new Patriots’ Path BSA app, rather than reporting through the BSA’s JTE website? Ideally, each Unit should have a someone assigned to record community service projects. If not, individuals can use the new Patriots’ Path BSA app (download from GooglePlay). This method is quicker and easier than recording your service hours through the BSA’s JTE website. You can be assured that all hours submitted through the app will be submitted properly by the Council to the JTE system. What are some age appropriate community service activities for Cub Scouts? The BSA has some great ideas on its website. You may want to check out the Council’s Facebook page to see some examples showcased by other Cub Packs. The Council’s Community Service Committee would be happy to help you come up with great ideas. Do Explorer Posts or Venture Crews need to report our hours? Yes. All Scouting groups are encouraged to participate in service projects, and to record those efforts. The Journey to Excellence (JTE) is a program established by the Boy Scouts of America to provide individual units with specific goals necessary to achieve objective of performing and reporting service projects. To learn more about the Community Service Committee and the JTE Program, Click Here. The SERV Award can be earned by Scouts, Explorers, Venturers, Cub Scouts and adult Scouters. 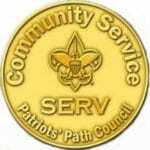 Patriots’ Path Council has established its own service awards program called SERV, designed to recognize all participants in Council programs each year, for their hours of public service. Click Here to learn more about the SERV Award, and to apply. Put your Scout spirit into action! Record hours for your service projects here, or use the Patriots’ Path mobile app.